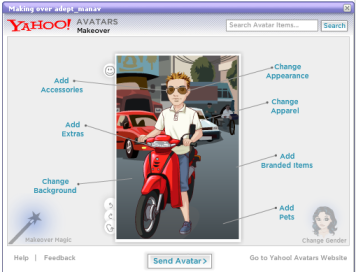 "Yahoo Avatars are on of the most commonly used application when it comes to express how you look to the world. Now if you want to make an avatar for your friend how you do it ? Today morning one of my friend, Angela sent me a customized avatar she just made it for me. It was really cool to see how it works. So I thought why not share it with you all. Its easy and works for your yahoo messenger interface directly..."